Midland Counties Publications (an imprint of the famous British aviation publisher Ian Allen) has just released Volume 14 of their Red Star Series, which has previously included such diverse subjects as Early Soviet Jet Fighters, Tupolev Tu-4 and Mikoyan’s Piston Engined Fighters. 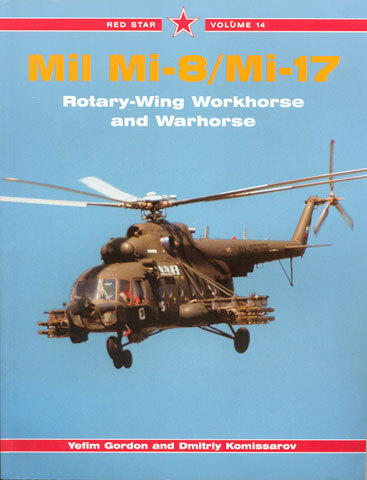 Volume 14 covers the Mil Mi-8 Hip and its many military and civilian variants. Author Yefim Gordon should be well known to Russian Aviation Enthusiasts both for his magazine articles and books on the subject, whilst in this volume he again collaborates with Dmitriy Komissarov with whom he wrote some of the Aerofax series on Russian aviation types. This book details the history of the Mil Mi-8 from inception in the late 1950s until the present day, and includes a brief examination of the Mil Design Bureau and some of their major helicopter types. The breakdown of chapters then follows a familiar structure covering in sequence the first generation Mi-8s, the second generation Mi-8s/17s, the Mi-8 in Detail, the Universal Soldier (military use), Peaceful Duties (civil use), Exports and finally a comparison with other medium lift helicopters such as the Puma, Sea Knight and Super Frelon. The coverage is very complete. Gordon and Komissarov walk the reader through all the variants of the Mi-8 family, providing clear photos of most distinguishing details to accompany the comprehensive text. New to me were the Mi-9/19 Tactical Aerial Command Post variant and the Mi-8T ASW variant which was only identified by a grainy photo in the Maritime Transport Hall of the Economic Achievements Exhibit in Moscow and possibly never proceeded beyond a few prototypes. With over 11000 airframes produced in the past forty years (second only to the Bell Huey family) it is not surprising that there are many variants to cover in the forty five pages devoted to this area alone, all of some use to the modeller. Of more general interest is the chapter devoted to operational use of the Mi-8 family in Afghanistan and Chechnya by the Soviet/Russian Military. 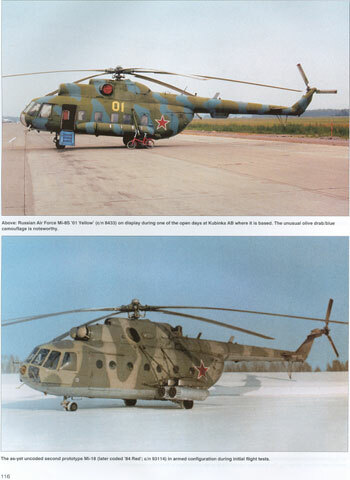 The development of defensive weaponry, the Mi-8 as a close support helicopter and countermeasures to the increased use of Surface to Air Missiles is all addressed here. The authors then cover all the export users of the Mi-8 over the years, including mention of its use by the US Army, but not the recently revealed employment by covert paramilitary forces both in Afghanistan following 9/11 and later in Iraq. This book will appeal to those with an interest in Russian aviation. Hard-core "facts and figures" fans are well catered for with different tables that cover technical specifications and details of combat losses in various modern conflicts. General arrangement drawings of the major production variants are included. The format of the book caters less well for those interested in the personal stories of the aircrew who commit aviation in these machines, although some anecdotes and stories of individual heroism are contained between the covers. For the modeller who is looking for close-up photographs and detail, this volume will be very useful, with hundreds of photographs included, mostly in black and white, but a section of 33 full colour images round it out nicely. The Mi-8 is not well served by the model industry, but Italeri has a number of variations in their 1/72 scale range, and those who wish to go to town on them will find this book a must. The book consists of 128 pages printed on glossy paper between cardboard covers.